About a month ago, my husband sent this DIY to me and about five seconds late, I knew I had to give it a try. 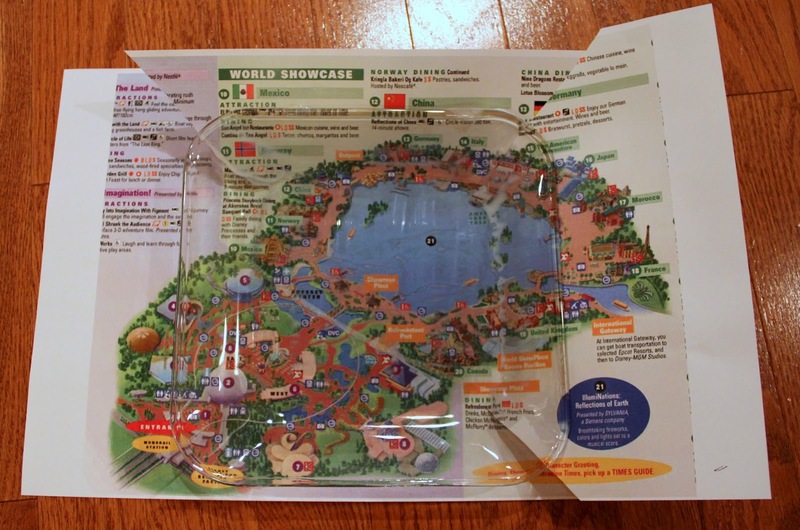 Figuring out what images to use was the easy part; Disney park maps...duh! The hard part was finding them/getting them printed. 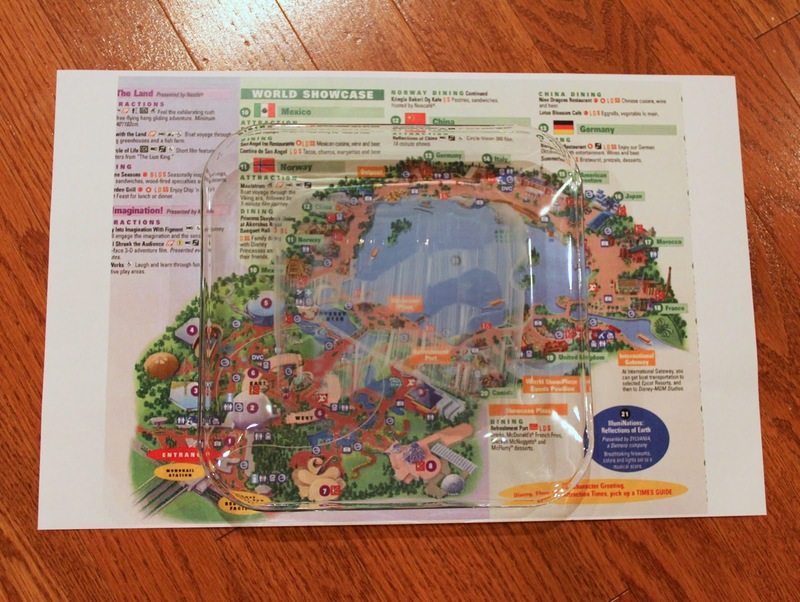 You would think that I would have park maps floating around my house somewhere, but apparently not. So after two days of tearing my house apart looking for maps, off to Kinkos I went to print out hi-res images of each of the parks. Make sure your size and print out your pictures on 11x17 paper. Now that you have everything, the rest of this project is a piece of cake. It just takes time while you let everything dry between steps. 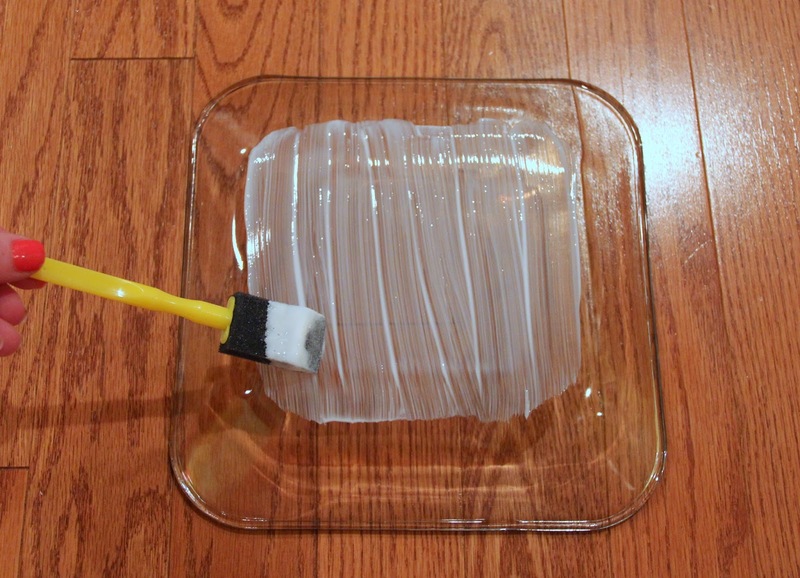 Clean you plate so that there are no smudges or dust. Then put a layer of Mod Podge on the back of the flat part of the plate. Now carefully and slowly (slow is key) flip the plate over and place (Mod Podge side down) onto your picture. You want to make sure the image is centered with the plate and that there are minimal bubbles (I'm pretty sure it's impossible to get no bubbles). For this next step you will need to cut a slit from the outside corner all the way to where the picture is tacked down so that the edges lay smooth. 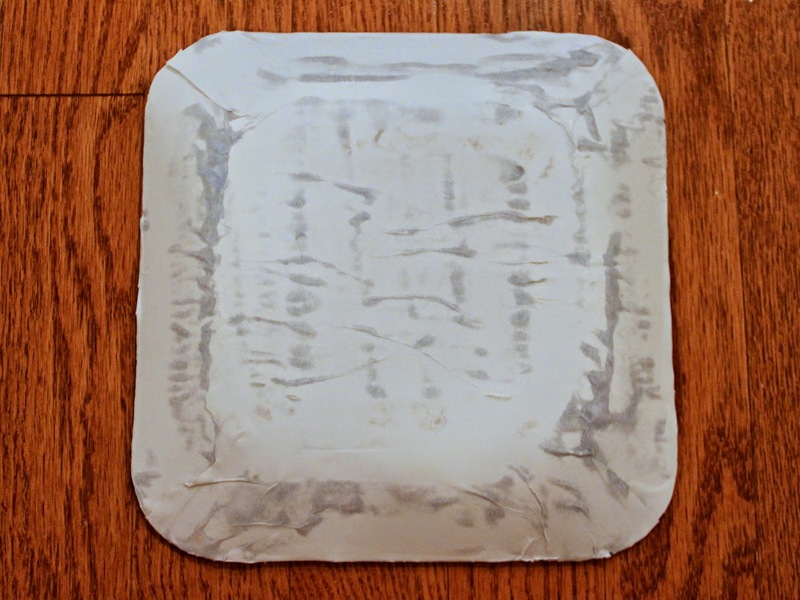 Then you will add your Mod Podge to each side one at a time and bring the edges up until the entire plate is covered. Now that the whole image is glued down, you will want to trip off the excess. I found this easier to do with smaller scissors or an exacto knife because you were able to get closer to the edge. Once you've trimmed it, flip it over so you can begin smoothing out the back. You will want to let it try for about 30 minutes or else the paper will get too soggy and begin to tear. Once it is pretty dry, add a layer of Mod Podge to the back using your brush to smooth out the wrinkles and any bubbles. After that layer is completely dry, you will add a final layer to seal the back as well as the edges that your trimmed. And there you have it! 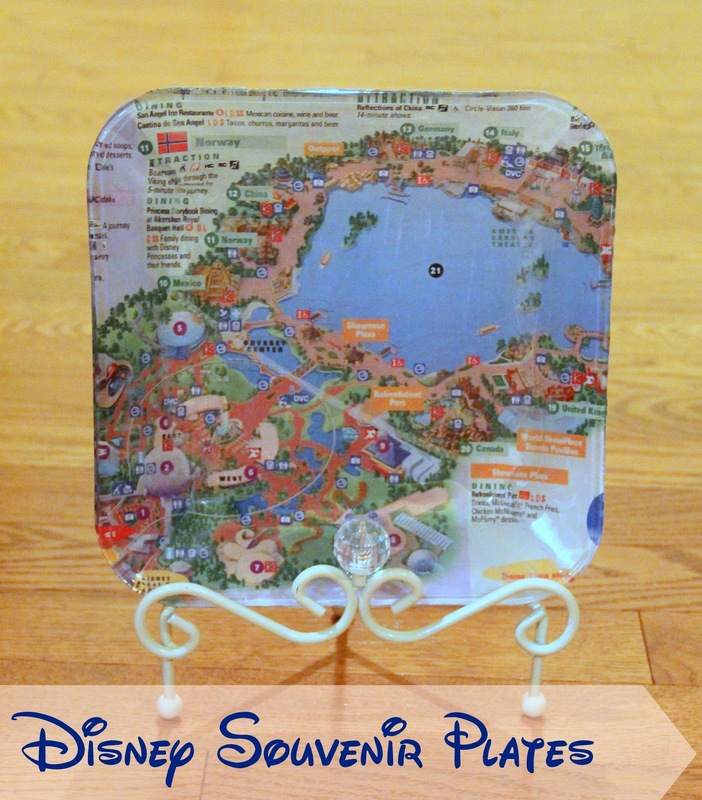 The perfect souvenir from your Disney trip! 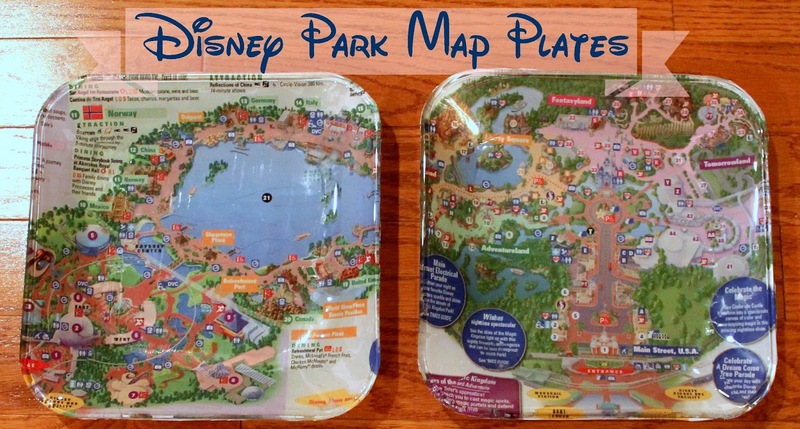 What I like about this is since they are always changing the parks, this is a great way to look back and remember what the parks were like during your visit. I can't wait to do the other three parks so I can display my whole set! What picture would you use for this project? This has to be one of the cutest ideas ever! It made my Disney heart happy! I will have to keep that in mind for my next Disney trip! Thank you! It is definitely super easy too! Will you just use these as display or will you actually eat off of them? You are amazing! I was just thinking on our last trip about what I could do with the maps. 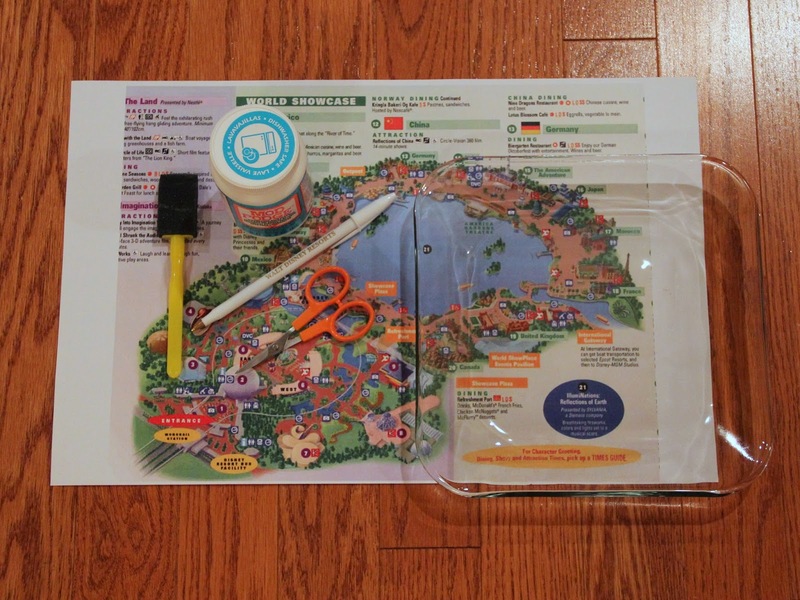 I made Savanna a place mat..but this idea is really fabulous as well! High Five and Happy 4th of July!